Color glazed and decorated with hand-applied fanciful botanical transfers that recall a lush English garden in the peak of summer. 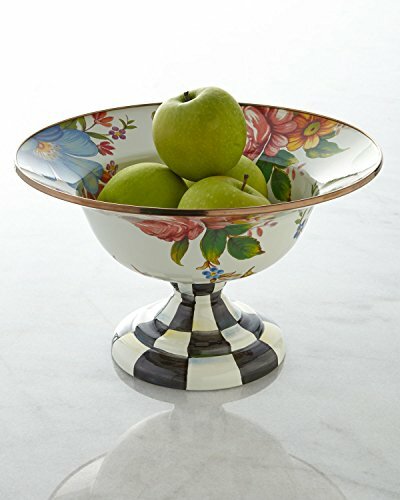 Hand-painted Courtly Check® base. Materials: Heavy-gauge steel underbody with hand-applied floral transfers, hand-painted with checks and ceramic glaze, rimmed in bronzed stainless steel. Dishwasher safe; for best results, hand-wash with mild soap and dry immediately. Pieces may vary due to the handmade nature of each product. Imported. Our enamelware exceeds both federal food safety regulations and California's Proposition 65, the strictest environmental safety standards in the U.S. Handle enamelware with care, and discontinue use for food service if it becomes chipped, cracked, or broken.